In his newest novel, J.M. 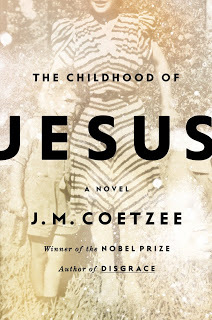 Coetzee reimagines the life that Jesus might have had in a vague, almost-contemporary setting. The boy, named David, finds himself in a peculiar Spanish town with the older man Simon who raises him as they look for his mother. When Simon stumbles upon a woman whom he senses is David’s mother, he must deal with this potentially unfit woman raising the boy who has become beloved to him. Based on the title, I was hoping for more about the character David (and how he was meant to be a stand-in for Jesus). Alas, David remains a remarkable enigma throughout the novel, with Childhood focusing solely on Simon and his exploration of what a family can be. Told in a dialogue-heavy manner, Childhood can be tedious at times. Simon’s unwavering ideas of the world are overly preachy. But Coetzee manages to present these concepts succinctly, engaging your mind in these philosophical musings. However, this style of novel will definitely not be appealing to the casual reader (in fact, much of Coetzee’s work is not terribly appealing to the casual reader).